On a night that never ends, the only thing worse than death … is becoming infected. 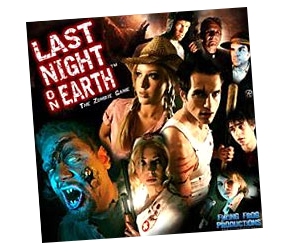 Simple zombie fun done right, with a liberal dose of dice rolling, B-movie characters and clichés. Last Night on Earth takes few risks when it comes to mechanics, but the photographic art is well done and the game doesn’t take itself too seriously. It also comes with a CD soundtrack that doubles nicely as a drink coaster. 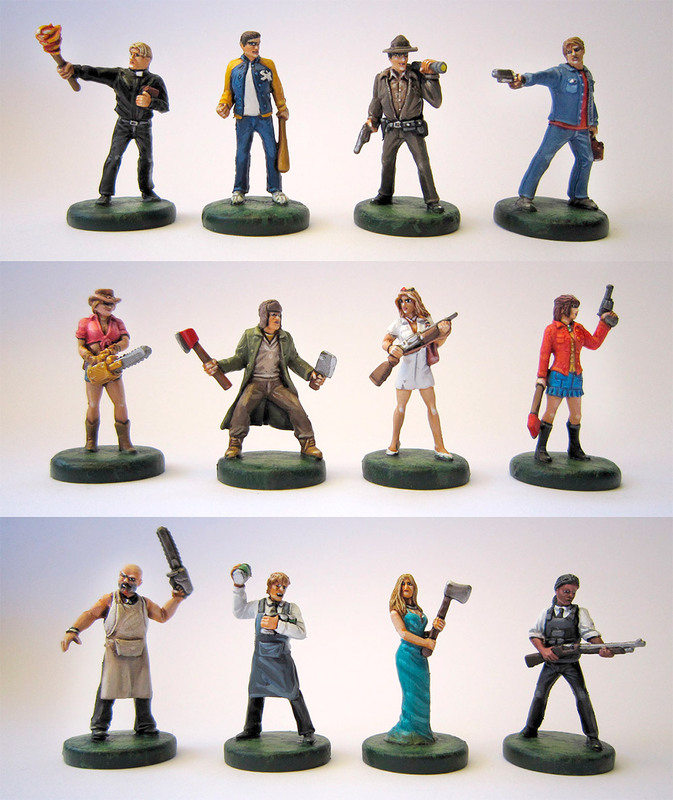 Set in the sleepy town of Woodinvale, players are B-movie hero archetypes—Sally the high school sweetheart, Jenny the farmer’s daughter, Sheriff Anderson the small town law man, Father Joseph the man of the cloth, to name just a few—banding together to fight for their lives. Eight different scenarios and modular board recreate classic scenes—the desperate race for the truck (“where are those keys! ?”), the barricading of the manor house (“barricade the windows!”), the search for guns and ammo. All the time, unending waves of zombies spread over the town like a plague. So put down that popcorn, grab your shotgun, and hide your brain; the zombies are coming and this could be your last night on earth! This hilarious and fun game has spawned several expansions: Growing Hunger introduces new game mechanics and three new scenarios to challenge players, as well as a two player mini-game. Four new heroes and seven new red zombies, new modular game board sections, and new game cards are included, plus lots of new counters and extra bits so you can create your own scenarios. You can expand both your hero options and your zombie types with the Hero Pack 1 and Zombies with Grave Weapons. Survival of the Fittest has three new card decks and several scenarios, and Timber Peak is a standalone game as well as an expansion which introduces the brand new town of Timber Peak with a full set of game boards, 6 new Heroes, 14 Zombies, new cards, rules and scenarios, and a new experience system. Finally there’s Blood in the Forest, an expansion that can be added to Last Night on Earth or Timber Peak and features new game boards, new types of zombie figures 2 new new heroes, and extra cards, counters, rules and scenarios. Great work on all the guides. Would love to see this one updated with the latest expansions: Timber Peak and Blood in the Forest.